The Volcano Art Center Ceramics Program has expanded to include evening classes, every Thursday, from 6 – 9 pm. The drop-in style class will allow local residents and visitors to Hawaiʻi Island the opportunity to try their hand at creating with clay on the potter’s wheel, without having to commit to a 8 or 10 week long series. Our teaching artist Erik Wold will be available for individualized assistance—answering questions and troubleshooting problems. The emphasis will be placed on getting a feel for working on the potter’s wheel and experiencing the thrill of hand-forming a pot in motion. Each class will include an introduction to working on the potter’s wheel, along with a step by step demonstration of its use. Students will then try their hand at wheel throwing under the guidance and supervision of the instructor. Students will be given up to 5 pounds of clay to experiment with during the evening. This is a chance to see how you like working with clay on the potter’s wheel, and perhaps consider a full-length class in the future or simply sign up for another Drop-in Evening! Students with all levels of clay experience are welcome. 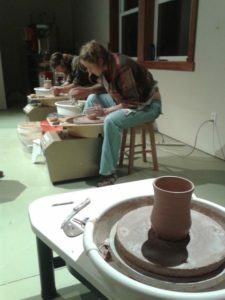 “Thursday Evening Pottery Drop-in” happens every Thursday from 6 – 9pm. Cost for each evening session is $35/$30 for VAC members. Class size is limited and pre-registration is required. Just for practice – Ample clay will be provided, to be returned to the recycle bin at the end of class. One-time attendee – $7 per lb. to be trimmed, glazed and fired by the instructor (typically about $7 per kept item). Returnees – $3 per lb. of clay purchased in the studio. Includes glaze and firings. No outside clay.